Welcome to the Windymains Timber Website. Windymains Timber is located in Humbie, near Edinburgh. This strategic location is ideal for raw material supplies and is close to the national motorway network for a quick response to customer demands. Windymains Timber became part of the Glennon Brothers group in 2005. 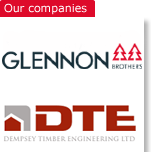 Glennon Brothers have plants in Longford and Fermoy in Ireland and acquired the Adam Wilsons sawmill in Troon in April 2008, making Glennon Brothers the premier name in the Irish & UK timber processing industry. Windymains was originally set up by Mr. Jim Harrison who grew the business from the ground up. Jim was very hands on in every aspect of the new sawmill process from planning, selecting the equipment, controlling the installation, supervising the commissioning and motivating the workforce. The business is now headed up by Mr. David Rodger who joined the company in September 06. Windymains Timber is located on a 22 acre site and is a specialist fencing and treated timber mill with an annual production capacity of 70,000 m3.